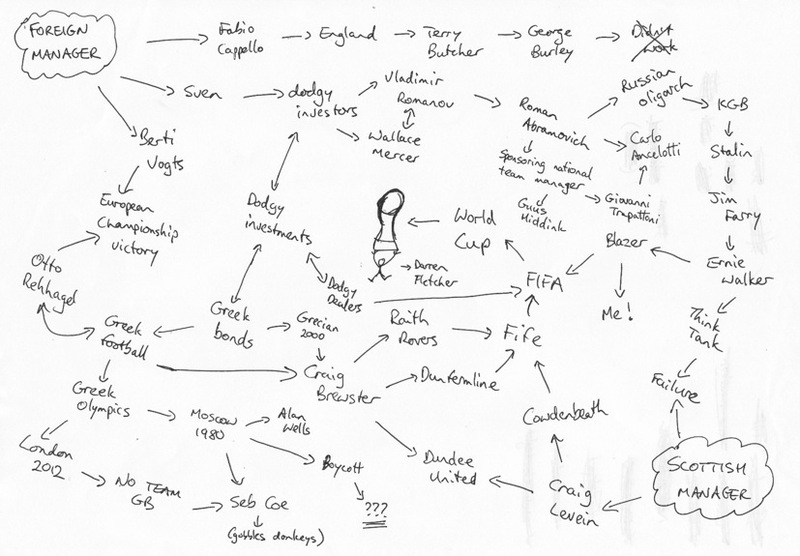 This week a leaked document came into my possession from a mole deep within the SFA hierarchy. Obviously I can’t reveal his name, so let’s just call him Gorgeous Pete. Gorgeous Pete tells me that SFA Chief Executive Gordon Smith was recently sent on a residential management training course – an order from the Hampden hierarchy after accusations of mismanagement of the dismal World Cup qualification campaign. During the 3-day course, Smith stayed in the Prestwick Thistle Hotel where his room is believed to have had such amenities as a trouser press, colour television, and kettle; additionally the hotel provides unspecified “business facilities” for all its guests. It is understood there was no in-room internet connection, but email could be downloaded by Fran in reception when she wasn’t checking in a new customer. On one of the courses, Smith learned about the technique of ‘mind mapping’. A mind map is a diagram used to generate ideas and help with the understanding of a problem space by creating links or branches between related concepts. Mind maps date back to the times of Greek philosophers, although they became popular in corporate circles during the 1960s as businesses of the time scrambled to adapt to the drug-fuelled ‘counterculture’. Smith returned from Ayrshire to Hampden proclaiming this technique as a way to see through the challenging task of finding a new Scotland manager. The leaked document reveals his thinking, linking 1980s hair-colouring product Grecian 2000 with failed England manager but successful lothario Sven Goran-Eriksson, via the European Championship tournament which Svennis failed to win. Neither Nevio Scala nor Dan Petrescu feature in Smith’s thinking. This explains a lot about the SFA’s thinking. Craig Levein – Cowdenbeath – Fife – FIFA – World Cup! George Peat – Pudding Face – Ice Cream and Jelly – Jellyfish – Portuguese man of war – Jose Mourinho?